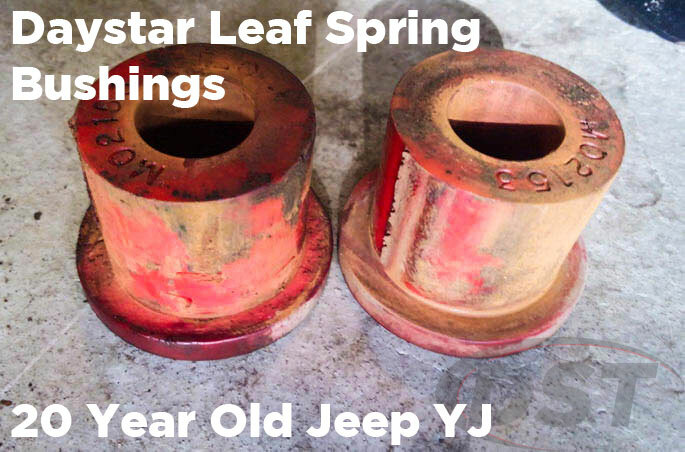 Polyurethane Leaf Spring Bushings from Daystar will hold your leaf springs in alignment better than OE rubber to keep your axle and wheels pointing in the right direction. Find the right leaf spring bushings for your vehicle below. If you've noticed a bang or clunk when going over rough terrain or steering wander after hitting a bump then you're experiencing symptoms of worn or damaged leaf spring bushings. If you have a 4x4 rock crawler or work truck then these bushings are more important than you might think. The leaf springs cushion your vehicle against the the bumps and vibrations of everyday driving and the stock rubber bushings do this really well, but they can wear out with excessive use and allow the leaf springs to shift. Daystar manufactures firmer polyurethane bushings that still provide some give but hold their shape much longer than the original rubber and keep your leaf springs where they need to be. The leaf springs on a live axle vehicle absorb the bumps and vibrations of driving before they get to the driver, but more importantly they help to locate the position of the axle and wheels which means they decide what direction your vehicle goes when you hit the gas. If your leaf spring bushings are worn and hollowed out then your axle's alignment could shift and cause steering wander, bump steer, or an awkward thrust angle. To make sure that your axle stays in alignment your leaf springs need to be secure and rubber won't always be up to the task. Daystar's polyurethane leaf spring bushings will last the life of your vehicle and will hold their shape through extreme circumstances and their bushings are covered by a lifetime warranty. 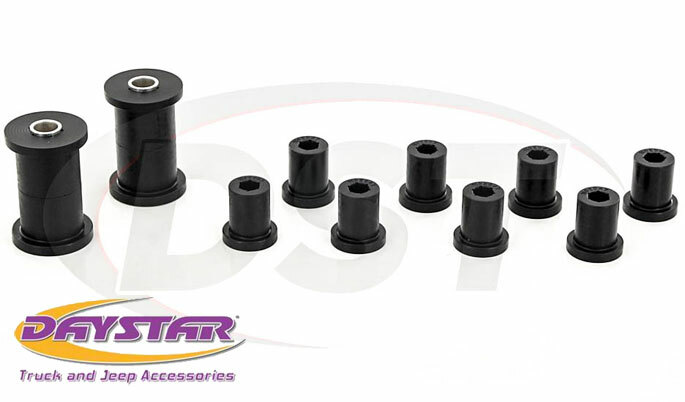 So whether you want to replace loose leaf spring bushings or future-proof the weakest point in your live axle suspension, Daystar poly bushings are a great option.